Been with Alliance for about 5 years and they are great. If something goes down they are on it seconds. I’ve tried 2 other carriers and nowhere near as good customer service as Alliance Phones. I’ll be with them for life. Great rates, best service out there. I recommend them highly. I’m the agent for Freight Broker, and need my phone service up 24/7. I think in 5 years it went down twice, and was up and running within seconds to maybe 5 minutes at most. Pros: FAST CUSTOMER SERVICE BEST EVER. Cons: NO CONS YET GREAT SERVICE. What we like most about Alliance Phones is how fast they react when we need an assistance with the setup of a certain feature. Everything is a matter of minutes. We were very surprised when we decided to setup our Auto Attend, and they informed us that they have a professional voice over artist as part of their options for that feature. She could do several different accents in different tones, and she is actually doing the voices for some characters in the animated movies. It was great news to know that this was handled by a professional. We sent them the script and one day later we received the actual recordings from them. They asked us to approve them and later that day we had our Auto Attend setup perfectly. n top of that, we saved a lot of money on our phone bills, compared to the previous providers that we’ve had, who did not gave us even 20% of the attention that Alliance Phones is giving us. A solid recommend! Stan was very helpful guiding us through our transition from landline to VoIP. Since we were new to this technology he patiently explain us what will happened. He give us proposed timeline and everything went as it was planned. We ordered 5 Cisco SPA 303 Phones. The nice thing is that the phones are not locked. Before we sign up with Alliance Phones we research other providers and we find out that even though they say “No Contracts” they still lock their phones and you would not be able to use them with another provider if you decide to. Cons: If you want to use your mobile phone you have to purchase the application. Cons: Still dependent on AT&T for Internet Connectivity. Cheap System. You get what you pay for, Terrible Sound and Call Quality. Unreliable Service. Alliance Phones offers users Cloud-based VoIP solutions for small and medium sized businesses. With a focus on individual users’ needs, the provider fits each system with reliability, accessibility, flexibility, scalability, and cost efficiency. With flexibility in mind, Alliance Phone supports a number of platforms such as: iOS, Android, Windows, and Mac. While many solutions claim to offer extensive customer service, Alliance Phones is strictly a business provider—i.e. they offer NO residential services; therefore, customer support is always at the user’s disposal. Additionally, Alliance Phones owns and sells technology they own. Most other providers resell solutions from other companies, which can cause confusion and/or inability when it comes time to troubleshoot the solution. Alliance Phones fits their solutions with tremendous versatility. In meeting this criteria, the provider offers a variety of plans, products, and solutions. Plans are broken down into three options: Easy Plus ($29.97 per user, per month; furnishes 1-3 users), Simplicity Plus ($24.97 per user, per month; furnished 4-20 users), and Effortless Plus ($20.97 per user, per month; furnishes 21-100 + users). Amongst these, Simplicity Plus is the most popular option. At $24.95 per user, per month, the Simplicity Plus plan includes unlimited minutes, rich PBX features, and no initial setup fees. The provider offers redundancies that allow customers to test the service before they commit to it. First off, customers are able to sign up for a free demo, which includes: a free temporary number, unlimited free calling for 2 days, testing, and feedback. Additionally, there is a 30-Day Satisfaction Guarantee in place. 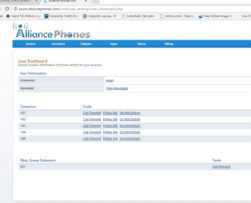 Alliance Phones’ service plans require a monthly contract. That being said, customers are able to try out the service before they lock themselves into a contract with the provider. Also, even if users are not happy with service in the first thirty days, they can back out and be refunded via the providers satisfaction guarantee. Separate from service plans/pricing, the provider also offers hardware—i.e. phones. Like their plans, their offered devices are broken down by 2 line, 3 line, 4 line, and 5 line Business IP phones, as well as Conference Systems. All phones come preconfigured, all users need to do is: plug the network cable into the business phone purchased and plug the power adapter into each business phone and then the power supply. In some cases POE (Power over Ethernet) may be available; therefore, only the network cable would need to be plugged into the phone. Some examples of their offerings include: for 2 line Business IP phones, Cisco SPA 2102 Phone Adapter with Router, Polycom SoundPoint IP 335 Small Business IP phone, and Polycom SoundPoint IP 321 Small Business IP phone; for 3 line business IP phones, Cisco SPA 303 3-Line Small Business IP phone; for 4 Line business IP phones, Cisco SPA 504G 4-Line Small Business IP Phone and Polycom SoundPoint IP 550 IP phone; for 5 line business IP phones, Cisco SPA 525G 5-Line Small Business IP phone; and for Conference Systems, the Polycom Soundstation IP 6000 Conference Phone. What Do You Think of Alliance Phones?